Chatting to a young Indonesian economist over breakfast this morning, I discovered that his impression of Nobel laureates had been radically changed by the Lindau meeting. The tendency to regard people who are highly qualified and experienced in one area as therefore competent to pronounce upon everything under the sun is a form of what is known as the “halo effect”. And it can have absurd consequences. In a press briefing that I attended, a journalist from a well-known news publication asked the American economist Peter Diamond to comment on the Eurozone. The journalist in question is an EU citizen resident in Frankfurt who has been reporting on European matters for several years. She has far more practical knowledge and experience of the Eurozone than Diamond. But because of his Nobel laureate status, he was presumed to have opinions on the Eurozone that were of more value than hers. To his credit, Diamond refused to answer the journalist's question, saying that his area of research was entirely US-focused. But other American Nobel laureates were not so humble. Edmund Phelps, in a breakfast briefing for young economists, extolled the virtues of American “opportunity” and criticised European “corporatism”. This was in a panel discussion on innovation sponsored by Mars, whose European representative - sitting on the panel next to Phelps – had much to say on innovation within large enterprises. And a young French economist on the same panel talked about entrepreneurialism in European countries. No matter. To Phelps, America was the source of all innovation, and Europe had a “terrible problem”. But Phelps actually undermined his entire argument by comparing the US with something called “Europe”. Had he compared the US with, say, Germany, it would have been a fair comparison, although I'm not sure his conclusions were justified. But directly comparing a country, even one with a federal model of governance, with a whole continent is absurd. Europe is astonishingly diverse, and although its residents do generally recognise a common identity called “European”, it does not have the strength of the “American” identity. “Europe” is still a work in progress. The idea that America is a “land of opportunity” is a myth. It's not so much the American dream as the Danish dream, or perhaps the Scandinavian dream. I wonder which of these august gentlemen is right? I suspect neither. It is too easy to see America as the source of all innovation and Europe as free-riding on America's inventions. But equally, it is unfair to dismiss America, which remains a vibrant individualistic culture. Such competitive comparisons are unhelpful and unnecessary. The whole presentation was excellent and his conclusions important. I shall write about this separately. But there is an important omission in the header of each of these slides. And that omission is telling. Smith was of course talking exclusively about the American housing market. But nowhere on his slides does he show that. 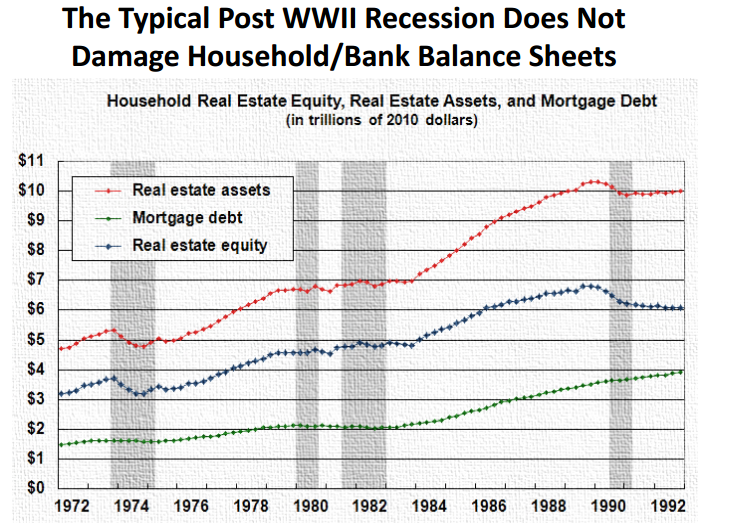 The slides are simply about “the housing market”. This was in a presentation to young economists, business and media representatives from 80 countries. Smith presented to this international audience as if all housing markets everywhere were like the US and therefore he did not need to define the boundaries of his research. But nothing could be further from the truth. Housing markets are astonishingly diverse, no doubt because housing is a basic survival need and in many countries also a primary source of wealth. 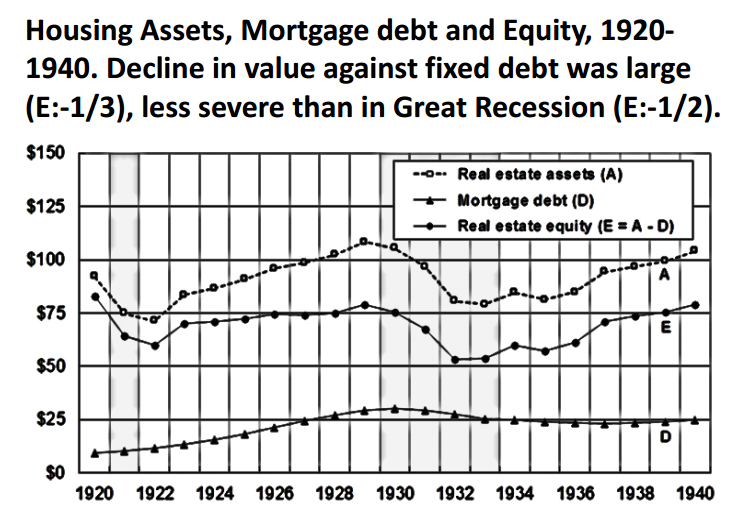 The US housing market is one of the most idiosyncratic: it has unique features such as 30-year fixed rate mortgages, warehousing and GSEs; it has more extensive government and near-government support than almost anywhere else; and it is as far as I know the only housing market where the majority of mortgages are securitised. Yet Smith did not see fit to tell his international audience that his research ONLY applied to the US and could not be taken as a model for anywhere else. Indeed he possibly didn't even think of that. The parochialism of American economists is at times staggering. Nor is it just economists who are ignorant of national idiosyncracies in key markets such as housing. I had an interesting discussion with an American freelance economic journalist about the Bank of England's Funding for Lending scheme (FLS). Under the FLS, banks can temporarily swap illiquid prime loans (mostly mortgages) for highly liquid treasury bills, which they can then use as collateral in repo markets, thus enabling them to obtain market funding more cheaply. I explained this to my American friend, and his response was “I don't think people understand securitisation”. Umm. This scheme is not securitisation, and it would not work in a largely securitised marketplace such as that in the US. It only works when banks have large balance sheets made up mostly of illiquid loans. In most European housing markets, lenders usually carry mortgage loans on their balance sheets rather than securitising and distributing them, which means that as their mortgage lending increases their balance sheets gradually become larger and more illiquid. To an American knowledgeable about economics and familiar with the operation of his own housing market, this is a very strange way of doing things. Yet to a European, it is the American way of doing mortgage lending that is odd. My American friend is indeed correct that people don't understand securitisation. To Europeans, it's a nasty American practice that nearly blew up the world. This is not unlike the “accent” problem. I have no accent. Of course I don't. Everyone else has an accent, not me. So when I went to the US on a business trip a few years ago, I walked into my company's New York office, said something and was astonished to hear from the other side of the office, “I LOVE that accent!” It took me some time to realise that the person they were speaking about was me. I have an English accent. Of course I do. We do not see our own idiosyncracies. The economics profession is dominated by Americans, and by research that focuses on American markets and American ways of doing things. Of 17 Nobel laureates presenting at the Lindau Economics Meeting, nearly all were elderly white middle-class male Americans – so hardly representative even of America - and most of them were doing exclusively American research. There is a terrible dearth of research that looks at other markets, particularly emerging ones: and an even greater scarcity of research that compares idiosyncratic markets, not in the Edmund Phelps compare-to-denigrate mode but in the interests of promoting international understanding of different ways of doing things. All economies have unique features, that grow from deep historical and cultural roots: all have common features too. The problem is disinguishing between those characteristics that are common to all economies, and those that are nationally or regionally idiosyncratic. When one nation is dominant in the field of economics, a research model that narrowly focuses on the economic features of that nation runs the risk of being interpreted as applying to all economies, especially if that model is developed by a Nobel laureate. Halo effects lead to “generalisation from the particular”, and a failure to recognise and promote understanding of economic diversity. There is no one right way of doing things, and the American way – or any other nation's way, for that matter – is neither universally applicable nor even necessarily the best. No. But you've missed the point. Economics is a diverse discipline: a specialist in, say, labour market economics may have nothing useful to say about the causes of either the Great Depression or the Great Recession, though he might have a great deal to say about the persistence of unemployment AFTER those crises. Would you expect a specialist in applied mechanics under conditions of Earth gravity to comment on the trajectory of a comet? Point taken. So the reason I should ignore what economists say on American TV is not because there is no daylight between their politics and their analyses but because they never preface an analysis with an assertion of their particular field of study? Granted, I don't think I've ever seen an interviewer ask or comment on an economist's field of expertise (with the exception of Bernanke's study of the Great Depression). Maybe my basic complaint is that economists speak with the same assumption of authority as a physicist talking about the fixed speed of light in a vacuum. I never hear anything akin to "based on these assumptions, which are open to debate, and within these limits of our studies, we think/recommend ..."). Apologies for taking your post and rambling on but economic decisions by politicians around the world have huge consequences, and I've begun to wonder if less harm might be done if they simply ignored all economists or, perhaps more fairly, if their decisions would be any worse if "economics" didn't exist. How much of this issue boils down to lack of data? Wouldn't macroeconomists, for example, love to have a bigger sample size from models calibrated with data pooled across all G20 nations? But how many of the G20 nations were collecting reasonable economic statistics in the 1950s? You implicitly assume that the only nation collecting reasonable economic statistics was the US. That is also an example of US-centricity. The US is not only far from being the e only nation collecting economic statistics at that time, its records are neither the most complete nor the most accurate. France, for example, has far better data - see Piketty. I don't think the narrow US focus of American economists has anything to do with data. I think it is their very natural and understandable preference for studying their own country - just as I have a natural tendency to write the most about mine. It seems that the Danes got securitisation of mortgages right about two hundred years ago. Clever little country. It helps to have a high density, homogenous population with a deep shared history. My screen name and avatar might both suggest that I have a soft spot for things Danish. Absalon was a Danish Bishop and the avatar is a picture of a piece of Royal Copenhagen porcelain - a small boy offering to hand you a pig. Demark's mortgage market is certainly unusual. And it seems very stable.